While it is understood that the internet, cell phones and air traffic systems rely on GPS technology to function smoothly, so too do other unexpected elements of the nation’s infrastructure — including millions of miles of underground pipelines. 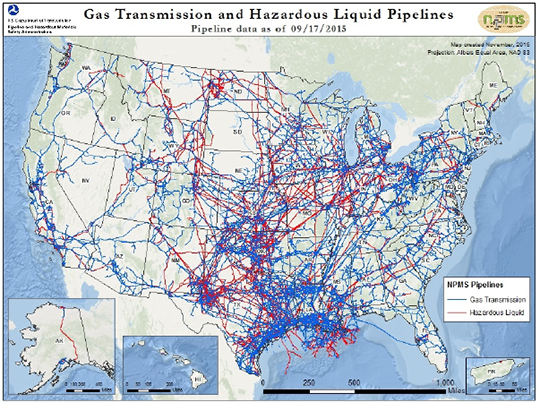 Researchers at the Volpe National Transportation Systems Center studying GPS-related dependencies found that real-time GPS position and timing data supported the 2-D and 3-D measurements needed to assess the movement, stress on and integrity of pipelines carrying natural gas and hazardous liquids. This monitoring information, which supplements data from inertial monitoring units and in-line devices, is used for maintenance and repair and to ensure the pipelines function safely. GPS timing is also used to synchronize the latticework of pipes for smooth operations — an approach similar to that used to support the electrical grid. Data logs of pipeline pressures, flow rates and other measurements — time-stamped using GPS timing data — are used for process scheduling and control. GPS also supports accurate mapping of both surface and subsurface pipelines, helping protect them from accidental damage by construction and utility installation crews, according to the report GPS Dependencies in the Transportation Sector. All told pipeline managers rely on GPS for the safe and efficient operation of some 2,708,652 miles of underground infrastructure, according to the Pipeline and Hazardous Materials Safety Administration. That network gathers natural gas from the wells and moves it to larger networks for transport. The pipelines also deliver natural gas to customers, transport hazardous liquids and carbon dioxide and are part of the system for storing liquid natural gas. • Electronic information signage and toll barriers (the latter rely upon GPS time signals to facilitate toll collection). • Flight Data Monitoring (FDM) systems, which support aircraft operations, maintenance and accident investigation. FDM systems get positioning data and timestamps for various applications including Flight Operational Quality Assurance. • Voyage Data Recorders or VDRs are required equipment onboard commercial cargo and passenger vessels. Like flight data recorders, they compile the basic data needed to aid in accident investigation. GPS provides location data and timestamps. The study authors also noted that transportation systems would be undermined if other critical infrastructure sectors that also depend on GPS — specifically the internet and the communication, information technology and financial sectors —experienced GPS problems. The inability to process credit and debit cards, for example, would hit the sale of fuel, passenger tickets and freight services, thereby scrambling the movement of people and goods. A GPS problem that hampers operations in any one of these interrelated sectors “would have a significant cascading impact” upon transportation operations including safety-critical functions. To help address the vulnerabilities Volpe summarized best practices for the transport sector and more than a dozen alternatives and enhancements to GPS to help sustain transportation should problems arise. Among the alternatives listed were multi-constellation receivers, eLoran, Locata, chip scale atomic clocks (CSAC) and fiber optics. ELoran was the system that met the most requirements without relying on a satellite navigation component. Volpe, however, did not take a position on building eLoran as a GPS backup, an alternative that has been discussed previously and is under consideration again. The Alliance for Telecommunications Industry Solutions (ATIS) was not so reticent. ATIS, an industry association that is also accredited by the American National Standards Institute, released a study of its own in September 2017 describing how the telecommunications sector has come to rely on GPS timing. GPS is presently the only way to widely distribute the UTC (Universal Time Coordinated) time standard, ATIS said, and the telecommunications industry is dependent on this capability. “There is no other option,” the authors wrote. But there should be, they said. As in the Volpe report, the ATIS researchers described a number of alternatives including using communications satellites to distribute timing information. ATIS, however, took a position — strongly recommending the adoption of eLoran.